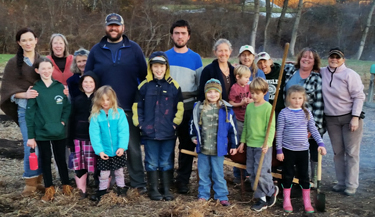 Beginning in 2015, the Western Massachusetts Master Gardeners have been working with the 4H Garden Club in an effort to educate and guide children and their families in the understanding and implementation of sustainable, organic gardening practices. 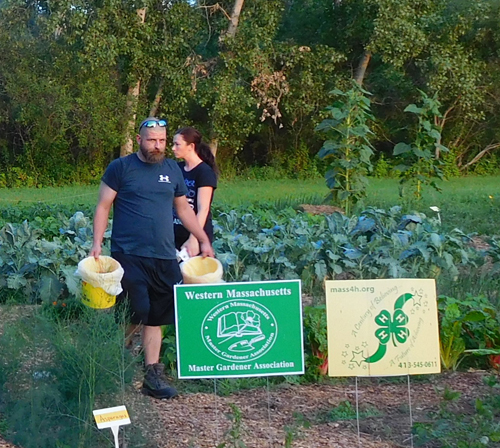 The “Giving Garden” occupies almost an acre at the Belchertown Community Garden, located on the Lampson Brook Farm on Jackson Street in Belchertown The farm is leased and managed by the New England Small Farms Institute. This land has been farmed for 250 years; 222 acres of working woodland rich with wildlife and native habitat, and 163 acres of farmland. 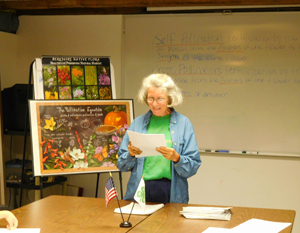 Garden Club meetings and classes are held in the old Horse Barn early in the season, then planting day is a flurry in late spring, followed by a season of gardening and harvest. Three generations of gardeners, from wide eyed newbies to the sage and experienced, work and learn together while producing food. Throughout the season local charities, shelters, and food pantries receive this garden’s bounty. It’s a richly rewarding experience to hear a child ask, ”What is soil made of?” or, “How do carrots grow?” and to see their enthusiasm blossom alongside the plants they’ve been nurturing. In between toiling, teaching, and learning, one can look westward for an inspiring and humbling view of the Mt. Holyoke Range. Or look eastward and see a smokestack from what remains of the old Belchertown State School, whose residents at one point worked on this farm to raise food to eat. Topics such as garden planning, crop rotation, pollination, soil structure & organisms, perennial vegetables, and insect & disease identification have been presented in the classroom as well as in the garden. It’s hands-on learning and a lot of fun! 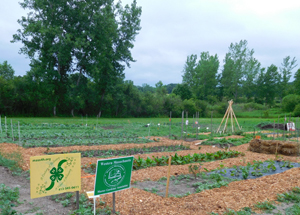 A demonstration garden is maintained by the master gardeners for interest and education. One demo illustrated the advantages of raising the bed to grow carrots. As the 2017 season approaches, we’ll be planning new demonstration plots as well as no till beds and raised beds. Also this year’s garden will focus heavily on root crops. 2017 Interns will have the opportunity to join in and see what this project is all about. It’s fun, rewarding, and addresses the issue of food insecurity. Come see what the chatter is all about!